An interview with Linda can be found on our website and blog. When Cali Huffman and Rory Lowe were 12 years old, they and their moms began volunteering at Reber Ranch to care for RASKC cats. Now six years later Cali and Rory are still helping cats at the store every week! From tweens to teens to adults, the commitment that these young women have been sustaining is absolutely remarkable. RASKC is tremendously grateful for the hundreds of shifts that Cali and Rory have contributed, along with their intention to continue. Please join us in congratulating Cali and Rory as outstanding youth. The Furry Faces Foundation's recent “Catsino” fundraiser netted over $500 for RASKC, thanks to the efforts of RASKC volunteers Melissa Blake, Dawn Gerken, Marie Gerken, RASKC Foster Care Coordinator Lori Mason, and the foundation. 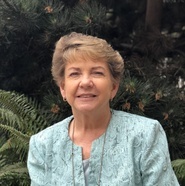 The foundation is led by Teri Ensley. A special shout-out of gratitude goes to Marie Gerken for asking several businesses to donate items for RASKC’s raffle prizes. The annual springtime “Catsino” event in West Seattle raises money for several local animal-welfare organizations. Mark your calendar for April 2019 to attend next year. 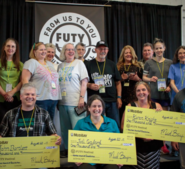 Be sure to register for Mud Bay’s festival that celebrates volunteers and employees who work for local shelters and rescue organizations. The event is taking place on Sunday, August 19, from 4pm-7pm at Magnuson Park in Seattle. If you are a RASKC volunteer or employee, please type in promotional code FUTY18S when registering. FUTY (“From Us, To You”) offers at no cost delicious food, libations, raffles, product samples, and giveaways. You must, however, register in advance of the event. You may begin voting on July 7 for RASKC’s nominee for the Volunteer Award of Excellence. The top three winners receive $1,000 each, plus a donation of an additional $1,000 to their respective organizations. The winners are determined by the number of online votes at //mudbay.com/futy. In previous years RASKC has nominated Melissa Blake and Sarah Stolberg (pictured) for the Mud Bay Volunteer Award of Excellence. Earlier this month the Washington State Gambling Commission (WSGC) led an investigation which resulted in over 300 roosters being seized. Multiple tips had been provided to the WSGC about illegal cockfighting in Port Orchard. Due to the drugs that the roosters were given, they were all humanely euthanized by certified staff. Two men have been charged and 27 additional people were detained. The WSGC, Washington State Patrol, Kitsap County Sheriff’s Office, Pierce County Sheriff’s Department, United States Postal Inspector, Homeland Security Investigations, Kitsap County Humane Society, Seattle Animal Control, Kirkland Animal Control, and Regional Animal Services of King County (RASKC) took part in this operation. “All of our staff did an amazing job, whether it was staying behind to keep operations running or assisting in some other capacity in the days leading up to the search warrant or the day following,” said RASKC Lead Sergeant Tim Anderson. For more information: WSGC press release ; Komo News; KIRO7. RASKC’s adoptable pets website page gets a makeover! RASKC has updated our adoptable pets website page to clearly show pets' personality colors – Easy-Going Green, Bashful Blue, or Rambunctious Red – on their profiles. The “thumbnail” is located near the pets' photographs. When RASKC was deciding whether or not to include a dropdown menu on the website to be able to sort by color, a number of volunteers were asked their opinion. Of the 29 people who responded, about 70% indicated that a dropdown menu should not be included. Most of those respondents indicated that a dropdown menu might result in too many people gravitating to the “green” animals and overlooking the “red” pets. Others thought the dropdown menu would be customer friendly. RASKC strives to give volunteers a meaningful voice in many decisions. Thank you, volunteers, for taking the time to provide RASKC with your input. Congratulations to new acting Shelter Sergeant Adryan Jones, who will be stepping up to his new role on June 30. His schedule will be Wednesdays through Saturdays. Adryan has been working at RASKC as an Animal Care Technician since 2016. Previously he worked at the San Diego Humane Society. Sergeant Adryan will be featured in the staff profile in the July edition of the RASKC Volunteer eNews. A great big “thank you” to current acting Shelter Sergeant Marcy Goldstone, who will be returning to her previous role as an Animal Control Officer. She will also continue to participate in the University of Wisconsin Shelter Management Fellowship. Welcome to RASKC’s newest Animal Care Technician Hillary Poulter (pictured). She grew up in Burien, then worked for PAWS in Lynnwood and the Emerald City Rescue in Seattle. 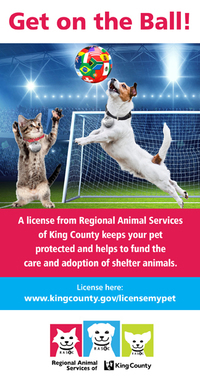 The creative genius of RASKC’s pet-licensing program recognized that the upcoming World Cup soccer tournament provides an excellent opportunity to remind residents to “Get on the ball” and license their pets! Stay tuned on RASKC’s social media. Share if you care! Join King County at the Seattle Pride Parade from 10am- 2pm on Sunday, June 24! RASKC volunteers, their friends, families, and their personally-owned dogs are welcome to join the King County contingent marching in the 42nd annual parade celebrating the LGBTQ community. This year's theme is "Pride Beyond Borders." If you like, you can wear your RASKC volunteer t-shirt to show your pride. As in previous years, we'll line up on Fourth Avenue near Seneca Street in downtown Seattle around 10am. Look for the big King County Metro bus. 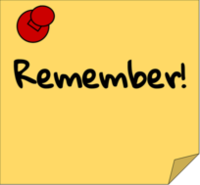 Check the forecast and be prepared for the weather on parade day - water, snacks, sunscreen, and hats are all handy items to bring. If you bring your own dog, have water and "poo bags" for them. RSVP for the event at this link. We'll send out more info as the day gets closer for those who register. Be sure to include your email in the Eventbrite RSVP. (No need to bring the Eventbrite ticket). Questions? Contact Lluvia Ellison-Morales. We hope to see you there! Tell us about yourself. Originally from Georgia, I have lived in Washington state now for 20 years and love it here. I currently reside in Puyallup with my three Bullmastiff dog children – Baron, Tanner, and Ruckus. I attended Portland State University in Oregon, receiving a Master’s Degree in Business Administration. I also lived and worked in Virginia and Nevada before returning to the beautiful Northwest. Why did you decide to work in pet licensing? I have proudly served as the RASKC Marketing and Licensing Program Manager for seven years. Being a huge animal lover, my job is a natural fit. One of the things I love most about my job is that every day, I get to help protect pets through licensing. It is so gratifying to get a call about a lost pet and assist with helping to get that pet quickly re-united with its relieved owner. I also love leading an outstanding pet-licensing team who works hard to support the pet-licensing process, generating licensing revenue to help fund RASKC operations. What did you do prior to coming to RASKC pet licensing? I spent more than 20 years in the banking industry managing the marketing, branding, sales, and business-development activities for various financial institutions. Just prior to starting with King County, I worked with the City of Auburn, developing their marketing and canvassing program to increase licensing revenue for their animal-services partnership with RASKC. What does your work for RASKC pet licensing involve? I develop and implement sales and marketing strategies, manage branding efforts, event planning, direct marketing, and door-to-door and phone-canvassing programs. I also manage sales partner relationships with 70 agencies and retailers selling pet licenses. I lead the RASKC Marketing Sub-committee, comprised of representatives of the 24 partner cities, to develop and execute integrated marketing plans to increase program awareness and pet-licensing revenue. I manage our database of 112,000 licensed pets and the licensing fulfillment functions, as well as the accounting activities for RASKC. What is the best part about your job? I like creating an environment where staff members can learn, grow, and contribute to our successful team efforts, providing the best possible service to our residents. 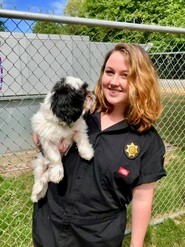 In addition to the pleasure of working with the pet licensing and sales staff, I am continually amazed at the tremendous work and implementation of new ideas from the RASKC shelter staff, Animal Control Officers, and volunteers. With the passion and dedication I have witnessed, it’s no wonder that RASKC has enjoyed tremendous success in so many areas of our program. What do you do when you’re not at work? I enjoy showing Bullmastiffs in AKC Conformation. I have owned, bred, and shown Bullmastiffs since 1993. I also love boating and fishing with friends on beautiful days in Puget Sound. Being outdoors on the open water is good for the soul. During my work commute, I like to read a variety of books, including memoirs, documentaries, as well as novels. Domino is a 13 year-old Pit Bull mix (A554219). His personality color is GREEN. This means he is an adaptable dog who loves to go with the flow. This sweet boy is full of love and snuggles! Silly, goofy, and adorable are his middle names. Domino previously lived in a home with children. His owner described him as shy, loving, and playful. He is also a very smart dog and knows how to “sit” and “come.” Domino would prefer a calm home. Although he is an older guy, Domino doesn’t let that slow him down. He loves to play, and he is always ready to settle down and cuddle with his favorite people. He also loves car rides and going on walks. Domino does not seem to get along with other dogs or cats. He is neutered, current on vaccinations, and microchipped. His $100 adoption fee includes a certificate for a free veterinary exam and an opt-in 30 days of free pet insurance through Trupanion. RASKC features a new Pet of the Week on our website. Several suburban newspapers also highlight RASKC’s Pet of the Week, thanks usually to the work of volunteer Dawn Gerken. Domino and RASKC’s previous Pets of the Week can be viewed on our blog. Fondest farewell to longtime fosters Bob and Lilian Yetter. Having provided care for RASKC/KCACC foster animals for over 20 years, Bob and Lilian are moving to Oregon. Lilian also organized several volunteer events. We will miss Bob and Lilian terribly, as we wish them the very best. Annual Springtime Foster Celebration Dinner - a great success! Over 30 volunteers attended the event last month at the Old Spaghetti Factory in Tukwila. Everyone brought home at least one door prize. No one could, however, win a prize for correctly matching all the baby photographs with the respective RASKC staff. Trupanion collected 10 tons of pet food to donate. Thanks to Trupanion last month for including RASKC as one of the beneficiaries of the wonderful contribution of pet food. Apply for King County’s Ruth Woo Emerging Leaders Fellowship if you have demonstrated commitment to public service. This one-year, paid full-time position ($21.54/hour- $27.39/hour) honors the legacy of Ruth Woo, who embraced empowering and advocating for youth from communities that are economically disadvantaged and historically have lacked opportunities to further their educational goals and career aspirations. Read this to learn more about Ruth Woo’s legacy. Deadline to apply: Thursday, June 28. Reber Ranch will be open only until 5pm, so the late shift will need to come in a bit earlier. There will be no shifts for Vet Clinic volunteers, nor any for Cat Meet and Greet volunteers. There will be an extra Dog Walking shift from 2pm- 4pm, but the normal 4pm- 6pm shift is cancelled. Sundays, 5pm- 7pm, alternating weeks. Highly skilled volunteer(s) needed.